Richard A. Grenell is a political consultant and media commentator who briefly served as national security spokesperson for Mitt Romney in his presidential campaign. 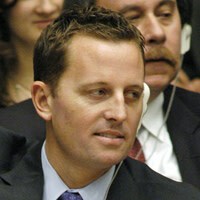 Grenell served as the spokesman for the last four U.S. Ambassadors to the UN. He is currently the longest serving American spokesman at the UN in history. He is a partner with Capitol Media Partners specializing in strategic and crisis communications issues with public policy challenges. He is based in Los Angeles, CA.